Where, how and how often does a vessel need to stock up on supplies? There are several types of supplies: spare parts, consumables (tools, paint, etc. ), provisions for the crew and lubricating oil. Requests for supplies are dealt with on a quarterly basis in the key ports (unless there are special needs) for parts required for scheduled maintenance, lube oils and provisions. The Procurement Department either delivers to North Europe ports of call, mainly from the warehouse at Le Havre, or arranges for supplies to be made available at the ports where vessels make a call. Among the items bought and delivered are spare parts for engines, electrical equipment, paint, office supplies, tools, lube oil, safety equipment, medicines, sheets, blankets, etc. In the case of the CMA CGM MARCO POLO, lube oils are purchased in Rotterdam on each trip, for consumables we generally supply these in Khor Fakkan, and spare parts in the Far East from the original manufacturer or approved supplier. How is the Procurement Department organised? 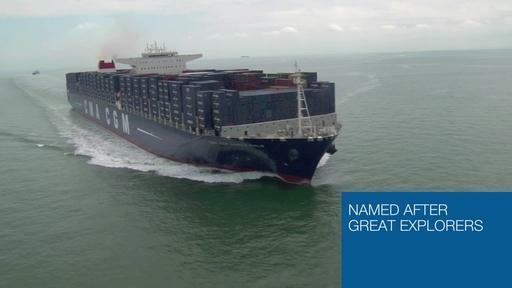 To meet the specific needs of vessels, particularly the CMA CGM MARCO POLO, we have an international team based in Great Britain, Asia (Singapore and Taiwan) and also France, where the majority are at the Head Office in Marseille. Procurement: negotiating, optimising purchases in terms of quality and quantity while controlling costs, and centralizing requests. The skill is being able to juggle the synergies and economies of scale created by a steadily expanding fleet. Logistics: providing the best service without a break in the supply chain, while avoiding any quayside delays for want of a vital spare part and fitting in with the schedules of vessels that are constantly on the move.